When you look at a dish in front of you, do you ever think about its history? How a dish got from its origin to the plate that is in front of you? I do it all the time and find the history of Thai food as interesting as the history of Italian and French cuisine. It fascinates me that certain dishes have traveled long distances from their source before becoming a “national dish” in some remote country: Chinese slaves, brought to Italy by Marco Polo, introduced Pasta in all forms and shapes to the Italian pride. Spaghetti, noodles, ravioli, tortellini, et al came from China, where you can still find them in all their variations, shapes, flavors, and appearance. Even pizza has its origin in the highlands of the Himalaya…except for the tomatoes; we can thank Christoph Columbus for those, just like corn and potatoes. 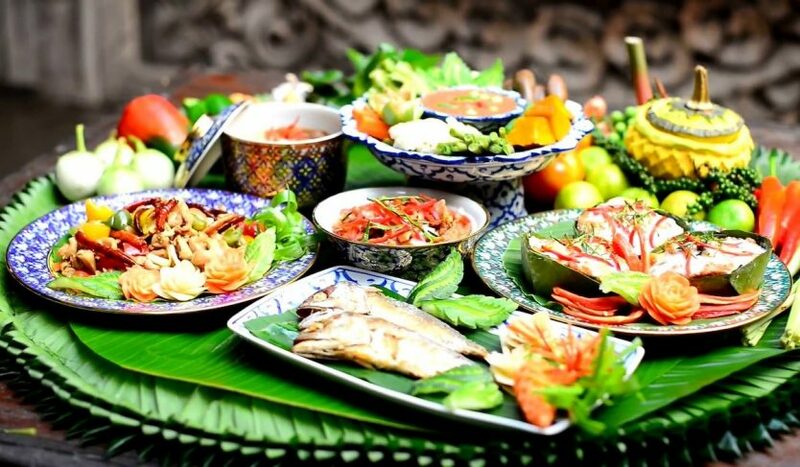 Many well known Thai dishes did also not originate in Thailand. A look at the history of Thai food shows that settlers from China, India, and south Asia introduced them to Siam. Most of the herbs and spices used are of Indian origin. India is the country of Basil! Over 140 kinds of it. The most famous one, the “herba basilicae” (Latin = emperor’s herb), is used in Italian and Mediterranean cuisine. Horapa and Kapraw became popular in Thailand and its neighboring countries. The curries used in Thai restaurants and hotels are of Indian and Pakistani origin. Even chili, which is now such an integral part of Thai cuisine, was brought to Thailand in the 17th century by Portuguese missionaries who discovered them while serving in South America. And if you eat a Thai dish which is not poised with chili, then it is most likely Chinese. All these sliced stir-fried poultry and meat dishes such as beef in oyster sauce, pork with young ginger, noodle soups, and so on? Chinese descent. And “Isaan Food” is only called so since the north-east of Thailand is no longer Laos. Before 1907 this part was Laos and therefore Laotian food…. I invite you to join me in thinking about the history of food more often. When you look at your dinner plate tonight, spend a moment to think how it arrived on your table through a long journey through time. Feel free to also ask our knowledgable staff if you have any questions about the origin of certain dishes on our menu.